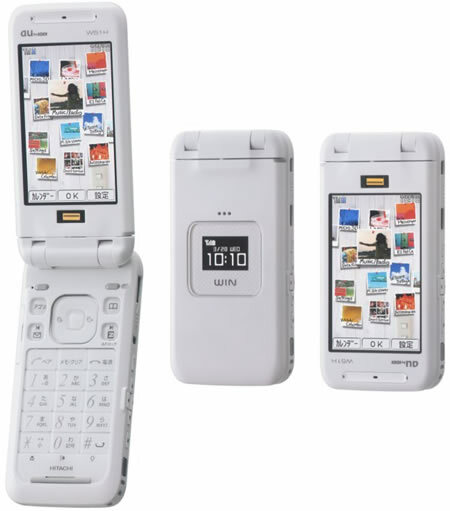 Kddi one of the top cell phone operators in Japan added 10 new phones to its lineup yesterday. We will be covering the most interesting ones starting with the Hitachi W51H. The clamshell has a 2.9 inch wide display which supports a resolution of 480 x 800 pixels which is the highest we have ever seen on a mobile phone. It also has an external color display for added convinience. A fingerprint scanner is provided to safeguard your sensitive data. As it is targetted towards business users the phone comes with a standard 2 Megapixel camera with LED Flash. The W51H has 30 MB of onboard memory and accepts MicroSD cards for memory expansion. The onboard GPS is voice activated so just speak out the destination and it will plot the best route towards it. 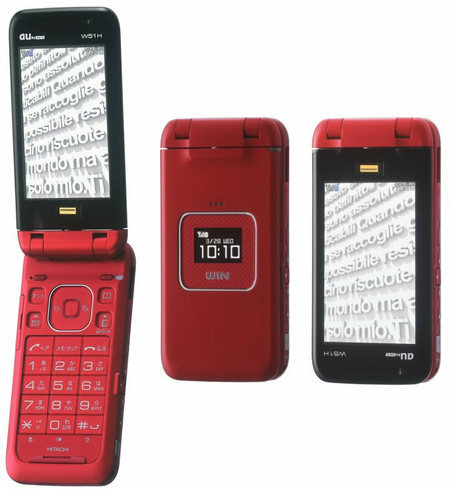 The Hitachi W51H measures 50×106×22mm, weighs 142 grams and will be available in three colors in Japan only.